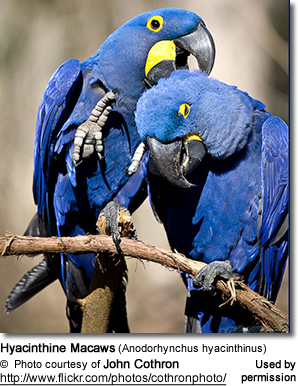 Hyacinthe Macaws are often referred to as the "gentle giant;" they are very smart but also require A LOT of special accommodations which can get costly, such as a special heavy duty cage that has solidly welded joints (preferably stainless) because of the immense strength of their beaks. Because of their powerful beaks that can inflict painful bites and damage household items, they require an experienced handler. They are very inquisitive and LOVE to play, so toys are so very important; and they go through them like water. I had the pleasure of spending one week with one of these "gentle giants" while working at a less-than-stellar rescue organization. This is a LOT of bird to handle. The weight of this parrot on your arms alone is quite significant. But they are truly awesome. This was an absolutely striking-looking parrot, with a somewhat mischievous and curious personality. I found him to be far less destructive and noisy than some of the other macaw species. He actually was pretty well behaved. He didn't chase the other birds (he knew that he was the boss anyhow) and I could leave him roaming around without him getting into too much trouble. This being said, their beaks are STRONG and should be respected. He can bite through electric wiring in a second - which would kill him and cause a fire hazard. The area this parrot is in really needs to be bird proofed before introducing him into it. Plus he could easily cause serious damage to your hand (or other body parts) in no time at all. Training a hyacinthe is even more crucial than for the smaller birds. Believe me, you don't want to have a hyacinthe with a bad attitude. I remember being careful the first couple of days as I was respectful of his enormous beak, but as he was rather gentle and playful my worries for the most part dissipated - although I don't remember a moment when I let my guard completely down. This truly is an awe-inspiring, impressive bird that deserves respect and commitment to provide this special being with the most interesting, high-quality life possible approximating that it would have enjoyed in its natural habitat. Special accommodations (a fun, well-equipped bird room with an outside enclosure) is really recommended for this large parrot. The fact that there are only very few left of these parrots in the wild is a devastating fact and my hope is that captive breeding programs in zoos and private aviaries will maintain this species for our descendants to enjoy. Bird experts often advise those interested in obtaining a macaw as a pet to educate themselves extensively about these birds prior to obtaining one, as these animals require more attention than a dog or cat and they are not considered domesticated animals by the official definition. Also, one should consider the bird's endangered status before choosing to own one, as international trade in these birds is illegal; in the U.S. trade of domestic Hyacinth is generally legal with restrictions varying by locality. by the use of their feathers by the Kayapo Indians of Gorotire in southern Brazil. These Indians use the feathers to make headdresses and other baubles for the tourist trade. Also, their habitat is being reduced by development. Annual grass fires set by gauchos can destroy nesting trees. 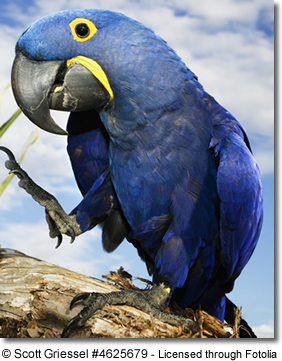 The Hyacinthe Macaws can get very noisy, but in general are somewhat quieter and rambunctious than other large macaws. They are generally inquisitive and become confiding quite quickly. 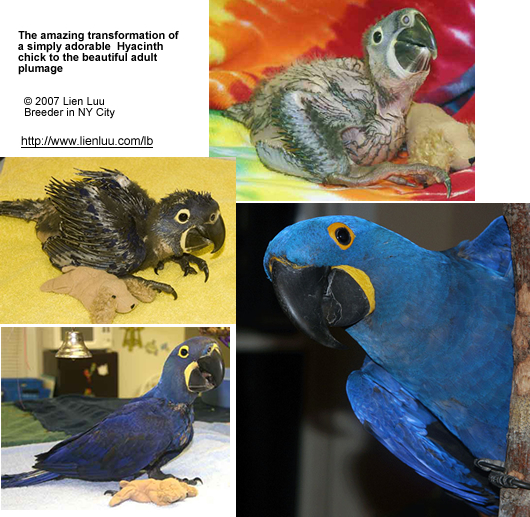 Breeding the Hyacinth Macaw in captivity has presented fewer challenges than originally anticipated; although fewer young are produced by them than by other large macaws. They breeding season in Central and Northern Americas usually commences in May. The breeding pair usually is more aggressive towards the care taker than they would be the rest of the year. Outside the breeding season, these peaceful parrots can generally be kept with other macaws (provided there is sufficient space for all) - and even smaller parrots and parakeets. However, I would hesitate to put the smallest of the parrot / bird species in an aviary with large parrots. Many larger parrots will prey on smaller birds, particularly during the nesting season when feeding chicks. Some breeders will actually put in smaller birds into an aviary for the larger birds to prey on - for entertainment as well as nutrition. This is a practice that I can't help but have serious issues with. They like bathing and being misted with water - particularly during the summer. In outside flights, they also move down to the ground frequently throughout the day picking gravel off the ground and chewing it. It has been noted that bonded pairs will often simulate copulation (with raised-up tails and lower parts of body pressed against each other) while being observed by their caretaker or even strangers. Like in the wild, the average clutch usually consists of 1 to 2 eggs; however, typically only one is fertile. Nestlings often throw themselves on their backs when their nestbox is inspected. The young fledge when they are about 90 days old, but remain with their parents for some time after leaving the nest. A lot of planning has to go into their accommodation as these large parrots are very hard chewer and can be very destructive. The usual construction aviary, simply won't do for those guys. Their strong need to chew needs to be satisfied by offering them a regular supply of thick branches and tree stumps. This will also provide entertainment, in addition to allowing them to exercise their beaks. Their natural diet should be as closely replicated as possible. 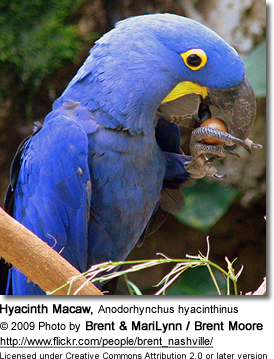 The regular "macaw" diet doesn't meet all their needs. The Hyacinths require a higher fat content in their diets, which is met by daily helpings of hard nuts, such as macadamia nuts, palm nuts, Brazil nuts, filberts and walnuts, as well as seeds. Their powerful beaks are able to crack the hardest nuts and seeds that most other parrot species wouldn't be able to open. They can even crack coconuts. However, nuts only provide one-sided nutrition. Their daily diet also needs to include fruits and other vegetable matter. The produce they are usually fed in captivity includes pears, oranges, apples, plums, bananas, cucumbers, half-ripe maize, carrots, rose-hips and rowanberries. A basic parrot mix that contains sunflower seeds, safflower seeds, hemp seeds, wheat, oats, canary grass seed and various millets should always be available to them. Good quality avian vitamins (D and B complex) and mineral supplements. 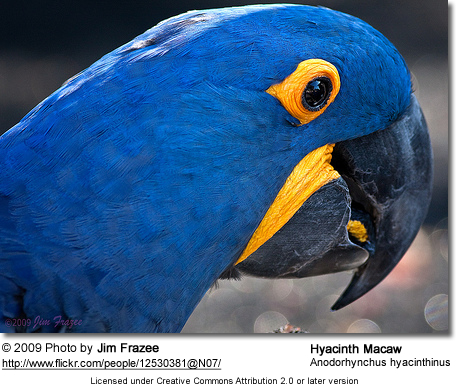 As is the case with all parrot species, Hyacinth Macaws are messy eaters.